Picture a young girl sitting under a grand piano, drawing pictures while she listens to the music. This is one of Teresa Jennings' earliest memories, and she spent many hours right there watching her father conduct rehearsals for operas, oratorios and Broadway musicals. To this day, this music stays with her, shaping her work as a composer. 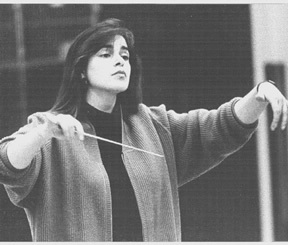 Born in Toledo, Ohio, in 1956, Teresa grew up in West Virginia where her parents, Donald and Suzanne Riggio, taught college while they pursued their musical ambitions as performers, conductors and composers. They are retired now, giving them more opportunity to further explore their talents as artists and writers. All five Riggio children have kept music in their lives. Brother Paul plays horn professionally in New York and is a composer with TV and film credits. Sister Anne is an opera singer who has performed with the San Francisco Opera, but who is currently a full-time mom for her young children, Celia and Benjamin. Her youngest brother, John, is also a composer, and currently works for Teresa's music publishing company. Brother Mark, a former NASA engineer, also works for the company. Teresa has always known that music was important in her life. She is an oboist, and plays many other instruments as well. She conducted community concert and jazz groups until the demands of a growing business claimed a majority of her time. She has inherited her father's conducting skills, always enjoying the challenge of molding growing musicians into expressive performing groups. Whether the musicians in front of her are children in schools or professional performers in the recording studio, they respond to her sense of excitement for the music she teaches. For more than a decade, her primary focus has been her compositions and the world of music publishing. She is most interested in writing music for children to sing, and her extensive work with jazz and rock has helped her develop a unique style. Beyond her wide vocabulary of musical styles, Teresa fills her music with emotion and strong values, though she always tries to remember that music should be fun to perform if it is going to affect the performer. She has learned the craft of music publishing while working with her husband, Paul, who is also a writer and a partner in their publishing business. They both worked for many years with Jenson Publications, but when it was sold, they decided that the time was right to start their own company, specializing in music for elementary music teachers and their students. That company is Plank Road Publishing, the publisher of Music K-8 magazine. Aside from running the business and writing the music, Teresa produces the recordings that set her works apart with children and teachers alike. Her songs are now enjoyed by young singers all over the world.